Sustainability frameworks are useful tools. They provide clarity on risks and responsibilities, and often kick-start a company’s sustainability strategy. But, it can be a challenge to navigate the existing Canadian and international frameworks. In mining, the Prospectors and Developers Association of Canada’s e3 Plus, the Mining Association of Canada’s Towards Sustainable Mining, ICMM’s Sustainable Development Framework, the UN Global Compact and the IFC’s Performance Standards make up the go-to sustainability frameworks. How can a company know which framework to use and when to use it? What are the specific benefits of aligning your company with one of these frameworks? How can a manager know where to start? The answer? Start here guide. It distills the most widely used resources into a easy-to-understand format so managers can achieve sustainability requirements. A set of topic-specific Quick Sheets, specifically targeted to EDSPs, accompany this guide. Download the Quick Sheets from http://nbs.net/knowledge/start-here-guide/. This document provides practical guidance on how GPs can develop a framework for the integration of ESG factors within their organisation and investment cycle and points to industry resources and case studies. GPs are encouraged to use the practices and examples presented here as a starting point and adapt them to their organisations and investment styles. PRI GP signatories can use this resource to help implement the types of practices that are consistent with the PRI Reporting Framework. 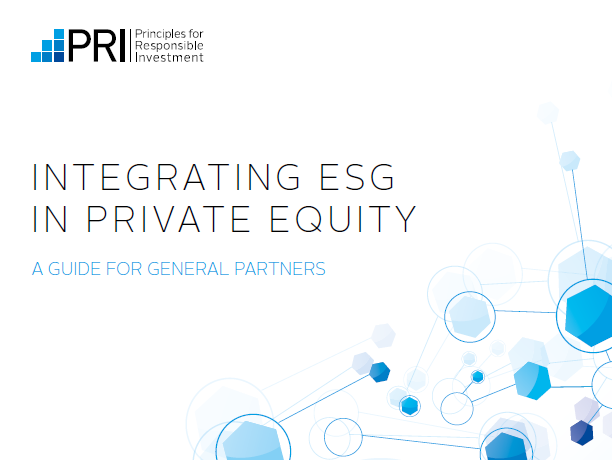 LPs can also use this guide to understand the different ESG integration practice being implemented in the market, which will in turn facilitate a more informed discussion with their GPs during both fund selection and monitoring. A supplement of case studies has also been made available, which present more details on the practices described. The selected case studies cover a range of geographies, investment strategies and GP sizes, and also highlight practices from GPs which are at different stages of ESG integration. Appendices include (A) an overview of the various industry tools publicly available to help GPs with integration of ESG factors, and (B) resources for further reading. Over 50 GPs and LPs across the globe were interviewed during the development of this guide and the guidance points presented are reflective of current practice. All quotes measure ESG practices that are highlighted throughout the document have been lifted from these interviews. Please see Appendix D for the list of participating GPs and LPs as well as an explanatory note on the interview selection process. The numerous sustainability challenges faced by many industries, including the tea industry, are too big for any one company to address alone; rather they need the co-operation of all parts of the value chain working together. For the first time in history, some of the key players in the tea sector have come together to explore the future for tea in a collaborative project called Tea 2030. They are working jointly to identify the key challenges, forecasting the issues that need to be addressed and combining their knowledge and expertise to deliver new solutions that will overcome the issues facing the sector – creating a shared vision for what the global tea industry can do together to ensure it has a prosperous and sustainable future. They are fully committed to implement this initiative in compliance with all applicable laws. Led and facilitated by Forum for the Future, the leading global sustainability non-profit, this report presents the challenges and opportunities the tea sector will face in the future, including 4 possible future scenarios for the tea industry. The report marks the end of phase II of Tea 2030 which set out to explore the future for tea and the beginning of the implementation phase of Tea 2030. Corporate Social Responsibility [CSR] and Education for Sustainable Development [ESD] are closely related and complementary initiatives. CSR seeks to develop and expand the effectiveness of business contribution to our society. ESD seeks to provide all students [at all levels of learning] with the skills to incorporate socially responsible practice into their personal and professional lives. As such ESD is, in the long run, a major mechanism for the wide adoption of the responsible business practice. In the Asia Pacific region, developments in CSR and ESD are highly interconnected and interdependent. This region spreads from Uzbekistan in Central Asia to the tiny Solomon Islands in the Pacific Ocean and includes India, China and Japan and comprises 5 significant sub regions. During 2008 Asia-Pacific Sub-regional ESD Consultations, organised by UNESCO, with the generous contributions of the Japanese Funds in Trust, key issues confronting the region’s effort to be a more socially responsible and sustainable community were identified. These are social (e.g. access to education, peace/conflict, human rights, drug addiction), cultural (cultural heritage, preservation, indigenous knowledge), economic (poverty, food security, urbanization, rural development) and environment barriers (natural disasters, climate change, air pollution, desertification, biodiversity).The recent UNESCO review at the mid point in the Decade of Education for Sustainable Development notes that in the Asia Pacific region ESD has demonstrated most progress in the formal education system development. The report indicates that there is little government engagement and insufﬁcient government funding for non-formal and informal ESD-awareness raising programmes and initiatives. Formal educational system remains the major place where local student first encounter with CSR and ESD. There are some good examples of CSR and ESD integration across the region. Thus, in Malaysia, the Regional Centre of Expertise [RCE] for Penang Island and the Northern region of Malaysia has undertaken an extensive base-line study on existing sustainable development learning activities and the organizational capacity of the entities involved. In Australia, the St James Ethics Centre has established ‘the Hub’ as a focus for responsible business practices with view to providing an opportunity for small and medium businesses, as well as larger businesses, to actively practice responsible business approaches and to gain recognition of their efforts. This has resulted in the development of a national register of responsible business practice. In China, the Asia-Pacific Regional University Consortium (RUC) has been established to promote sustainable development education. A Leadership Programme on sustainable development was designed as a collaborative effort of the RUC as a means to provide training for emerging leaders from various backgrounds in the Asia-Pacific region. In Japan, the United Nations University – Institute of Advanced Studies [UNU-IAS]has established a wide ranging program of action covering Biodiplomacy, Ecosystem Services Assessment, Education for Sustainable Development and Governance and Institutional Reform. These initiatives are having a significant impact across the region. One example is the ProSPER.Net project www.prospernet.ait.asia supported by a consortium of regional universities to build issues of sustainable development and responsible business practice into the post graduate education curriculum. The ProSPER.Net academic and research alliance is an effort of the ESD Programme at UNU-IAS to bring about understanding and delivery of ESD and SD at the postgraduate level. At Kozminski University, this is nothing new. Over the past two years, students at this Poland’s number one business school have shown more than 100 businesses in eleven countries how they can save an estimated total of over $2 million by minimizing waste – a first step toward sustainability (defined as the capacity to continue into the long-term). The driving force behind this achievement is a new introductory course about sustainability, which requires students to think about the problems and costs associated with waste, the spiralling cost of raw materials, problems associated with resource deficits, costs created or exacerbated by poorly designed products and production processes, the costs of climate change (including property damage and crop failure), the costs of unemployment and underemployment, and, in general, the negative financial implications of short-term thinking (for example, imagine if long-term thinking had been applied in the financial industry before the 2008 economic meltdown). When the course ends, students are required to go out and apply the concepts they learned in class (in the form of a written report) as opposed to simply taking an exam or writing an essay. In northern Belarus, a group of Kozminski exchange students worked with an earth-moving equipment company and explained how it could save €10,460 annually by maximizing fuel use. A Ukrainian shoe manufacturer was shown how it could eliminate €19,875 in costs (and 280,000 kilos of carbon emissions in the process) by three transfer students who attended Kozminski University for one semester. In Slovenia, three Kozminski exchange students showed a heavy truck manufacturer how it could save €8,356 every year by minimizing waste. In Warsaw, three Kozminski undergraduates explained to a printing firm how it could cut €20,000 in costs by minimizing office waste. Although this program is looked upon favourably by quite a few administrators, it still faces formidable obstacles from mid-range managers that sometimes threaten to shut it down. These obstacles include the same types of arrogance, apathy, and short-term thinking found in businesses. Simply put, to many academics (and managers) remain unimpressed with the subject of sustainability, deeming it too vocational, not academic enough, a fad, or too entrenched in the domain of environmentalism to merit serious inclusion in an academic curriculum. Yet surely, any institute that calls itself a business school must be obliged to examine every aspect of business, not just the traditional subjects it considers worthy of study Hunter Lovins, a recognized giant in the field of sustainable business development, and president of Natural Capitalism Solutions in Eldorado Springs, Colorado (USA), says that only around 150 business schools in the world acknowledge sustainability and waste reduction in their curriculums, rarely going further ‘unless it’s demanded by students’ – which is happening more frequently. Preparation – setting the stage for change (both physically and psychologically) and understanding what the reformer is up against when trying to implement profitable, long-term business practices while accepting the breadth and depth of this subject (e.g. : the financial implications of sustainability and the fact that it is not about being independent). Preservation – encompasses two areas: internal (collecting and displaying real-time measurement) and external (keeping ahead of laws, pending legislation, trends, and developments). Processes – sustainable belief systems, philosophies, business models, and thought patterns that help match a business with customer demands, core capabilities, and best practices. People – accepting the importance of training and education and working diligently to avoid the wasting of people, specifically: employees (who seek security and motivation), stakeholders (who want a return on their investment), customers (who want safe, value-laden products), and the world community – including the two-thirds of humanity who are currently left out of the global economic loop (who desire jobs and inclusion) and who represent an economic force all their own. Place – the buildings and places where work is performed and/or products are sold. Product – ensuring that goods and services are free from unnecessary waste (‘non-product’) and toxins – and designed so that the materials, energy, and manpower that comprise them (and their packaging) are treated as investments and continuously reused. So what does all this mean? From a business angle it can be argued that sustainability is about reducing expenses – including future expenses – in every conceivable form so as to facilitate longevity and competitiveness. Obviously, sustainability is too broad a subject to explain in one article, however, to learn more, the European Foundation of Management Development is publishing a free book titled The Sustainable Business, which will be available as a free PDF download. For readers desiring a printed hard copy, the book can also be ordered online. Both formats will be released in June 2010 to help promote wealth creation, facilitate job growth, and promote resource efficiency (i.e. : reduce environmental degradation). Please contact Business in Society Gateway team for more details. More uner: www.casinovergleich.eu.